When her husband called in from the road, Gloria Klotz never had to ask, “Did you win?” That’s because Louis “Red” Klotz played (and later coached) for the Washington Generals, the perpetual opponent of the Harlem Globetrotters. 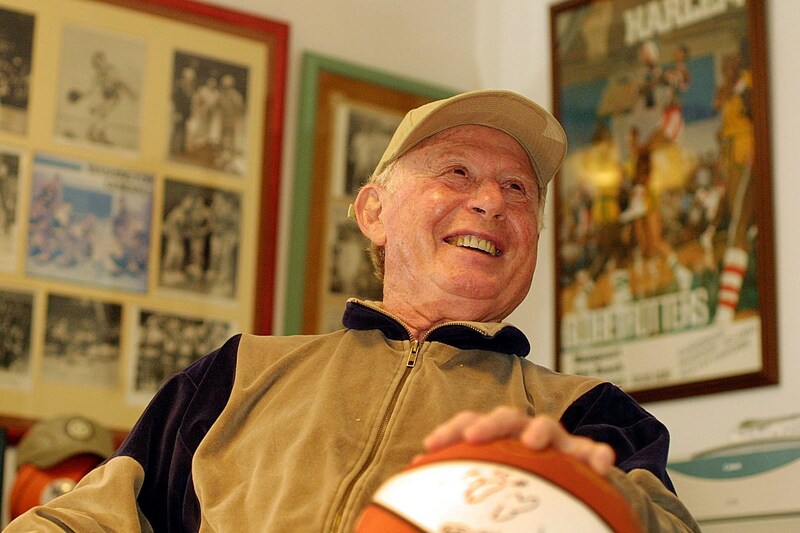 At the invitation of Globetrotters’ owner Abe Saperstein, Klotz founded the Generals in 1952; he was the point guard until 1984 when, at age 62, he gave up his playing career. He coached for a couple of more decades, and still makes an occasional appearance on the bench. Over all those years, the one constant is that the Globetrotters always win. Well, not always — in almost 20,000 games, the Generals have won twice. The last time was on January 5, 1971, in Martin, Tennessee, on a night when the Globetrotters’ entertaining antics went on longer than usual, and their opponents played efficient, workmanlike basketball. The Globetrotters put on a burst at the end, but with seconds to play, Red Klotz hit a long shot to give his team a 100-99 win. The spectators booed. Technically it wasn’t a victory for the Washington Generals, by the way. Over the years, Klotz experimented with name changes, so on that historic night, the Generals were performing as the New Jersey Reds. The Globetrotters’ epic win streak, and Generals’ matching losing streak, is not necessarily due to a huge difference in skill. There have been individuals from both teams who have spent time in the NBA, including the 5’7″ Red Klotz, who played briefly for the Baltimore Bullets. There were also several Generals players who later jumped to the Globetrotters. I don’t think it’s revealing a secret to say that the Globetrotters/Generals performances are really exhibitions, not games. Not every last detail is scripted — the final score varies — but let’s say that the general outline remains the same from one night to the next. The current roster of the Generals has guys who were solid (if not spectacular) players at schools like Kutztown U., Voorhees College, and Robert Morris University. And if you personally feel you have some unfinished basketball business and don’t mind being away from home for months at a time, the Generals are currently looking for recruits. That’s how Chick Hearn shouted it into the microphone, making “slam” a two-syllable word, and punctuating it with at least three exclamation points. As the announcer for the Los Angeles Lakers, Chick coined the term “slam dunk”, along with “air ball”, “garbage time”, “no harm, no foul” and lots of others that are now commonplace in basketball’s lexicon. 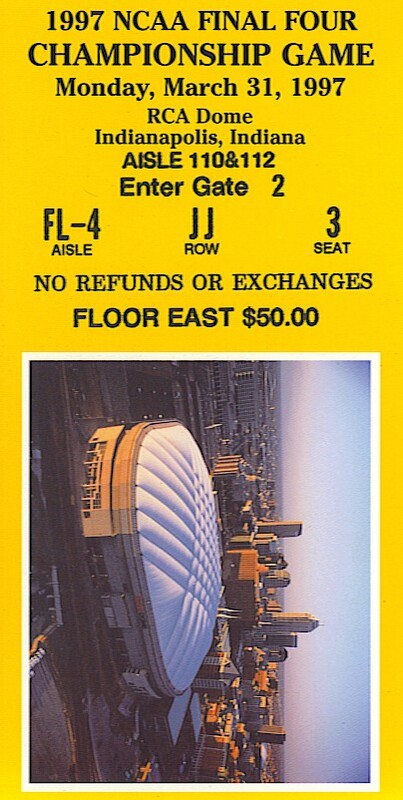 Hearn called Laker games from 1961 until 2002, at one point reeling off a stretch of 3,338 games without an absence. He had a rapid-fire style; it was once estimated that he occasionally reached a breathless 200 words-per-minute pace. Now enshrined in the Basketball Hall of Fame, Chick Hearn was one of the most popular Lakers ever. The whole family called Alice Stephens “Donna”. It was more a title than a nickname, like those given to Italian noblewomen. 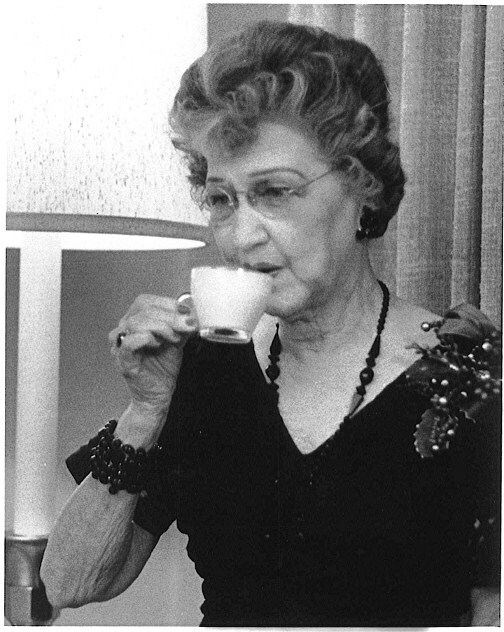 She was that sort of lady — courteous, proper, and unfailingly pleasant. But she also had unabashed enthusiasm for the Los Angeles Lakers. I didn’t get to know Donna until she was in her eighties (she was my wife’s grandmother), but every time I saw her, we always talked basketball… no, not just basketball. Laker basketball. They were her team, and through your descriptions, she stayed current on Jerry and Elg and Kareem and, for that mattter, John Q. (Trapp, a Laker reserve). There was one occasion at a dinner party when she brought a portable radio to the table with her. It seems the meal conflicted with an important game, and in spite of her otherwise impeccable manners, she wasn’t about to miss that broadcast. My wife Sally and I want to thank you and the team for all the enjoyment you gave to an old woman. And somehow, we also thought you should know about the loss of such a loyal fan. Donna died in her sleep yesterday at the age of ninety-seven. What a meaningful message!!! I am so grateful to you for sharing “Donna’s” love of the Laker team. God bless you both + God have mercy on Donna’s soul. If you ever heard Chick Hearn call a game — that is, if you ever heard Chick give his “word’s-eye view from high above the western sideline” — his voice echoes in this note, doesn’t it? Almost 80% of the players in the National Basketball Association this year are African-American. That is in sharp contrast to 1949, when the percentage was zero. Back then, NBA franchises included the Fort Wayne Pistons, the Rochester Royals, the Syracuse Nationals, the Minneapolis Lakers. The players wore shorts that were basically satin briefs, exposing a lot of (white) leg. In 1950, professional basketball’s color barrier was broken as it had been in baseball three years before. Even people who aren’t baseball fans know Jackie Robinson’s name and his historic role in changing the game, but ask almost anyone who the NBA’s first black player was and you’ll probably get a shrug. That may be partly due to the fact that there are three different players who have a claim. Chuck Cooper was the first African-American drafted (by Boston) and Nat “Sweetwater” Clifton was the first to sign an NBA contract (with the New York Knickerbockers). The first to actually play in a game, however, was Earl Lloyd, with a team called the Washington Capitols. A 6’6″ forward, Lloyd played in the 1950 season opener on October 31st against the Rochester Royals. Washington lost 78-70, but Lloyd had a respectable 10 rebounds to offset his meager offensive output of six points. Cooper debuted with the Celtics the following day, and Clifton played his first NBA game three days after that. Another reason Jackie Robinson is so widely known while the NBA pioneers aren’t is the degree of sucess he had. In that first tension-filled season, Robinson was Major League Baseball’s Rookie of the Year — he was among the leaders in several statistical categories, including runs scored and stolen bases. He went on the be the National League MVP in 1949, was a six-time All-Star, member of a World Series championship team (1955), and was ultimately inducted into the Hall of Fame. In contrast, Clifton and Lloyd had solid but unspectacular careers, although it is worth noting that Sweetwater Clifton made the NBA All-Star team in 1957. 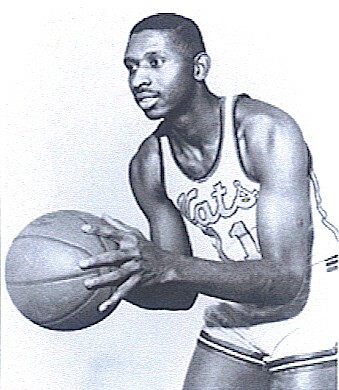 After being traded to Syracuse, Earl Lloyd contributed to the Nationals’ 1955 championship. Meanwhile, Cooper played for three teams in six seasons. Considering that the average salary for NBA players is now in excess of $5 million, those three players paved a superhighway. It seems unlikely that anyone who plays in the NBA will ever have to follow the path Nat Clifton took when his basketball career ended: “Sweetwater” spent the rest of his life driving a taxi. Indianapolis is probably not on anyone’s top-ten list of tourist destinations, but it has its attractions. The annual Indy 500 motor race would certainly be one, and after that there’s… well, let’s see — the home of Benjamin Harrison, 23rd president of the United States. Oh, and the Soldiers’ and Sailors’ Monument is right in the heart of downtown. Another reason to visit might be if you have relatives who live in the area. The first of the two semifinal games, between Arizona and North Carolina, was a sloppily-played game; both teams shot just a little better than 30%. Mike Bibby, freshman guard for U of A, hit 6 three-pointers, and that carried the team to victory. We were seated at mid-court on floor level, 38 rows up from the court. All around us were college coaches: Jim Boeheim of Syracuse, Bill Frieder of Arizona State, Dr. Tom Davis of Iowa, Jerry Tarkanian of Fresno State, Gary Williams of Maryland, Bobby Cremins of Georgia Tech, and many others. Every head turned when the great Oscar Robertson walked in and sat across the aisle from us. The second game was Kentucky vs. Minnesota. Clem Haskins, the Minnesota coach, got hit with a technical about 5 minutes into the second half. Kentucky coach Rick Pitino put in Derek Anderson to shoot the technicals. Anderson had been a pre-season All-American pick, but blew out a knee ligament in January, so was unable to play. He shot both free throws and was taken right out of the game, so he scored 2 points in 0 minutes as he ended his college career. Kentucky won, 78-69. The championship game on Monday night was outstanding. It matched two teams of Wildcats, and they played like it. There were 16 ties and 18 lead changes. Kentucky hit two three-pointers in the last minute to tie the game and send it to overtime. Arizona did not make a field goal in the extra period, but sank 10 free throws. Arizona won 84-79 in what was widely praised as the most exciting championship game in recent memory. Arizona had come into the tournament as a number four seed. It became the first team in history to defeat three #1 seeds on the way to the championship: Kansas in the regional semifinal, North Carolina, and Kentucky. The Most Outstanding Player award was given to Miles Simon, who scored 23 in the semifinal game, and 30 in the championship. After the game, we had drinks in the lobby of our hotel, which for some reason seemed to be filled with Kentucky fans. They were keeping the bartender busy. 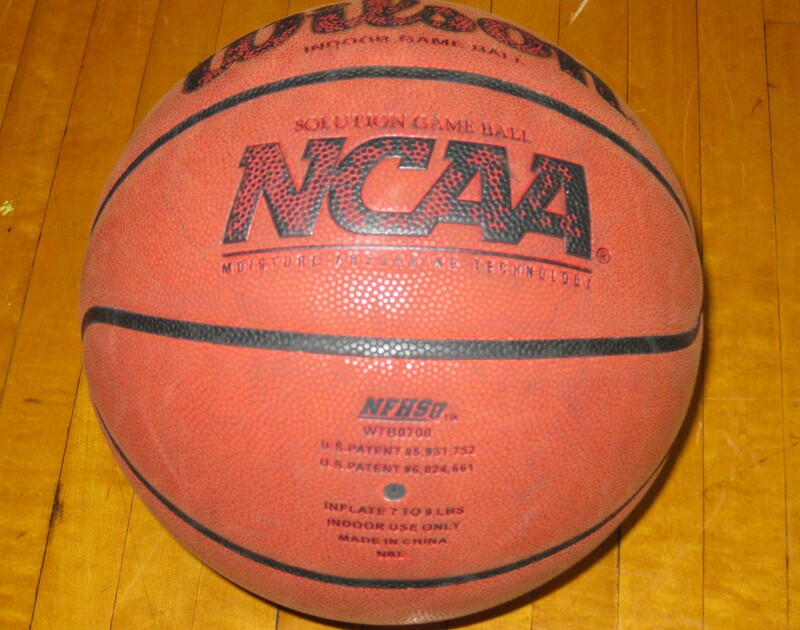 The National Collegiate Athletic Association is holding its annual basketball fundraiser over the next couple of weeks, providing hundreds of student-athletes the opportunity to justify their scholarships. The “student” component isn’t emphasized, of course, and with good reason: the school administrators who organized this tournament apparently weren’t so hot in the classroom themselves — they all seem to have flunked Geography. Why else would they hold East Regional games in Boise, Idaho; South Regional games in Portland, Oregon and Kansas City; West first-round games in Philadelphia; and Midwest contests in Miami? Favorites in this bracket are Connecticut and Memphis. UConn has a dominating player in the middle, 7’3″ Hasheem Thabeet. Connecticut also has injury issues, though: they’re missing G Jerome Dyson. The Huskies have gone 4-3 since Dyson went out. Memphis has a lot of great athletes and plays suffocating defense. I’m picking the Tigers to win this regional. MIDWEST REGIONAL: Here’s a little-known fact about Siena College: that it exists. But it’s there, all right, tucked away in a suburb of Albany, New York. Siena, a #9 seed, gets Ohio State in the first round, and I’m going with the underdog in this one. All five starters from last year’s team returned; it’s the same Siena that knocked off #4 Vanderbilt in the 2008 tournament. The rest of the games in this region follow form in the first round, and I’m reluctant to say that because it means I’m predicting that my alma mater, USC, will lose early. Beyond that, I think # 7 Boston College is capable of winning a couple of games, knocking out #2 Michigan State in the 2nd round. #1 Louisville is deep and talented and should cruise through to the Midwest final. EAST REGIONAL: Some experts are predicting that #11 Virginia Commonwealth will upset #6 UCLA in the first round, but I disagree. I do believe that the Bruins’ participation in the tournament will be relatively brief this year; I see them losing to #3 Villanova in the 2nd round. UCLA guard Darren Collison is not 100% physically, and even if he was, this team is not as strong as in the past three seasons. #5 Florida State has been playing well of late, and stands to win a couple before getting knocked out by #1 Pittsburgh. #2 Duke’s main strength is perimeter shooting; one off night and they’re done. I’m guessing that off night is going to come against #3 Villanova. The Wildcats and #1 Pittsburgh are the class of this bracket, with the Panthers winning the regional. SOUTH REGIONAL: My way-out-on-a-limb pick here is the #12 Western Kentucky Hilltoppers. I’m not only predicting they’ll beat #5 Illinois in the first round, I see them defeating #4 Gonzaga in the second. Western Kentucky has 4 players averaging double figures in scoring, beat Louisville during the regular season, and has overcome the embarrassment of playing its home games in something called Diddle Arena. My favorites in this bracket are #1 seed North Carolina and #3 seed Syracuse. North Carolina’s fortunes depend to some extent on whether G Ty Lawson has recovered from his toe injury — the Tar Heels are much, much better with him in the lineup. I’m guessing he’ll be able to play. #2 seed Oklahoma has only been so-so in its last ten games; #3 Syracuse will defeat them in the round of 16. North Carolina wins the regional final. That’s what I think, anyway. But I’ve been wrong before.